Why should I care about climate change? How much do my dietary decisions matter? How much do my purchasing decisions matter? 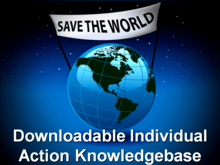 To see how much information the Climate Web pulls together about the relationship between individual action and climate impacts, take a look at our Personal Decisionmaking and Individual Action Deep Dive — and now you can purchase this Deep Dive for download to your desktop! Even if you are already working on individual action and climate change mitigation, you are unlikely to have access to anything like the information you can find in the Climate Web. With the Personal Decisionmaking and Individual Action Deep Dive, you can build a knowledge management system customized to your needs and save many hundreds of hours in populating your knowledge management system.